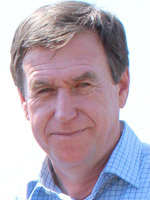 Dr Brian Keating is Executive Director of CSIRO's Agriculture, Food and Health Sector. He directs research that is vital to the Australian economy, environment and society, including agriculture and aquaculture industries, linkages between food, nutrition and human health and biosecurity for agriculture and the threat of emerging infectious diseases. Dr Keating has 35 years experience in agricultural and natural resource management research and development with leadership roles including the Chief of the CSIRO Division of Sustainable Ecosystems (2004-2008) and a past Board member of Sugar, Rainforest Ecology and Management and Tropical Savannas Co-operative Research Centres. Dr Keating has authored over 200 scientific papers covering diverse topics including soil and water management, plant nutrition, soil carbon and nitrogen cycling, crop physiology, farming systems analysis and design, bioenergy, simulation modelling, climatic risk management and food security. Dr Keating served as the CSIRO representative on the former Domestic Offsets Integrity Committee from October 2010.